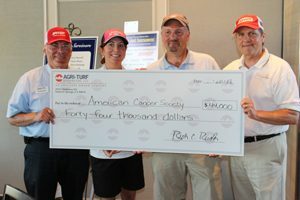 From left are Lon Records, CEO of Agri-Turf Distributing; Kristen Thompson, executive director of the American Cancer Society’s Desert Coastal Area; Tad Heitmann, chair of the American Cancer Society’s Orange County Community Council; and Rich Records, president of Agri-Turf. More than 120 golfers turned out for Agri-Turf’s Third Annual Malcolm Stack Charity Golf Tournament at Tustin Ranch Golf Club on July 20, 2017. The event raised more than $44,000 for the American Cancer Society (ACS). After play, everyone joined up at the clubhouse for dinner and a silent auction. Agri-Turf CEO Lon Records opened the evening festivities by thanking the sponsors for their generous support. Records thanked the Agri-Turf Team, suppliers, and the local business community for making this year’s event possible. Major sponsors included Bell Laboratories, Brandt, Calcium Products, Cool Planet, Ensystex, Grigg Brothers, Pest Control Supplies, the University of California Irvine, and Zoecon (Central Life Sciences). Next year’s tournament is scheduled for Thursday, July 26, 2017. Agri-Turf Distributing is a privately held, employee-owned company based in Santa Fe Springs, Calif. Established in 2013, the company serves licensed applicators in the professional pest management, fumigation, golf, turf and ornamental, vegetation management, and vector control industries in California.